Shuffle the decks any way you want. When you are done shuffling, cut the deck and make the cut card the “bottom” card by moving the cards in front of the yellow cut card to the back of the deck. Put the cards in the shoe and “burn” a card – take the first card out, turn it face up and slide it across the table, showing it to everyone. Then put it in the discard rack. When everyone has a chip in the circle or has told you they are not betting, you can deal the cards. Last, pull a card face down from the shoe and slide it across the table to yourself, placing it under your face-up card so they can’t see what you have. It’s easier to do this if you press one finger on the right side of your card, lifting the left edge off the table slightly. Announce, “Insurance is open” and run your hand along the insurance line. Almost no one will take insurance. (See insurance rules). After a few seconds, say, “Insurance is closed,” and run your hand over the insurance line in the other direction. Turn your cards 90 degrees on the table so that the long edge of the card is parallel to the back edge of the table. Put one hand on each side of your cards to hide the sides, and turn the cards up so you can see your bottom card, but no one else can. This stops the game, and prevents players from splitting or doubling and betting more money on a sure loss. If any player has blackjack in this case and did not take insurance, you tie them and they keep their money. If a player has blackjack and took insurance for half their bet, pay the insurance bet at the rate of 2 to 1. The two blackjacks -- the dealer's and players' -- are a push. If no one has blackjack, they all lose their bets. Collect their chips from right to left. If the dealer does not have blackjack, collect all he insurance bets. The game continues as usual. Don’t offer insurance, but do check your hole card to see if it’s an ace. If it’s not, put your cards back down and continue playing. Go to “player’s turn,” below. The player requests a hit. They’ll tap or scratch the table and say, “Hit,” or you can ask if they want another card. Given them one card and announce their new total until they reach 21 or go over. Aces can be one or 11, so any time they have an ace, say both numbers. Example: The player has a 2 and an ace. That’s 3 or 13. If they reach 21, go to the next player. If they go over 21, tell them “too many,” and take their cards and bet away. The player wants to stay. Just go to the next player. The player wants to “split” pairs. Splitting is allowed when a player gets two of the same value card, or same rank. (Example: player gets two 6s, or the player gets a 10 and a Jack, both worth 10 points.) They can place a second bet, equal to their first bet, and break the two cards up into two blackjack hands. In a casino, the player will put a second bet in the circle and point with the first and second finger in a “V” shape, signaling “split.” They don’t touch the cards. As the dealer, you separate their cards to each end of the circle, and move the bet to above each of the two cards. You then make and play a blackjack hand out of each of their cards, one game at a time. You’ll put a second card on their card to your left and announce the total. Add cards if they want to “hit,” and stop when they stand. If the player first two cards are both aces, and they want to split aces, they only get one card on each ace, (They’re trying to get the “10” on each of those hands.) If they don’t get the 10, their total is whatever they get, and the game continues. The player wants to “double down.” Players are allowed to double on their first two cards only. They can double on any total, but it’s more common if their first two cards total 9, 10 or 11. If they double, they can add to their bet, but only get one more card. You just deal them one more card, announce the new total, and move to the next player. When all the players have their turn, it’s the dealer’s turn. If the dealer total is 16, you must draw a card. If the dealer total is 17 to 21, you stop play and “pay and take” winning and losing bets. If the dealer total is over 21, announce, “Dealer breaks,” or “dealer busts.” Then you pay everyone who still has money and cards. Leave all cards on the table. When all bets are paid, scoop all the cards, right to left, then the dealer’s cards, and put them in the discard rack. 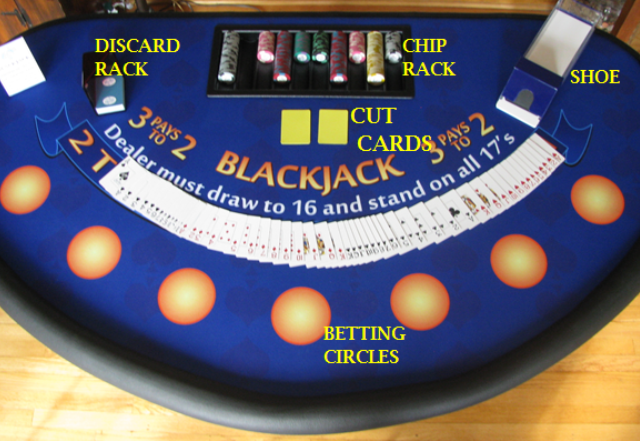 As you are dealing two cards to each player, you realize a player has blackjack. You can announce, “Blackjack!” to let them know you see it, and continue dealing until everyone, including the dealer, has two cards. If the dealer does not have blackjack, you can pay the player’s bet right away. Blackjack pays 3 to 2, so a $5 bet pays $7.50, and a $10 bet pays $15, etc. When the dealer’s visible card is an ace, finish dealing two cards to all players, then offer insurance by announcing, “Insurance is open” and passing your hand over the insurance line. A player taking insurance will place a bet on the insurance line. Their bet must be any amount up to half their original bet. After a few seconds, announce, “Insurance is closed,” and pass your hand over the line in the opposite direction. Check your cards to see if the dealer has blackjack. Just take away any insurance bets and continue the game. Next, pay the insurance bet at the rate of 2 to 1. If they bet $5, give them $10, and they can take all $15 off the insurance line. Anyone who has blackjack will tie the dealer, and not lose their original bet. Anyone who does not have blackjack and didn’t take insurance loses their original bet. Anyone who does not have blackjack but took insurance will get twice their insurance bet, equal to their original bet. They’ll lose their original bet, but get it back from their insurance bet, and break even. The dealer takes their bet and puts it in front of the rack. Count out half their bet, and put it back into the betting circle, then take away their original bet. Error 1: The dealer miscounts the player's total: If this happens, just announce the correct count and apologize for miscounting. Error 2: The dealer exposes the dealer's hole card during the deal. If the dealer's second (hole) card is accidentally exposed in any way that one or more players might have seen it, leave the card exposed and offer each player the option of folding their hand and keeping their bet. Players who remain in the hand will play as usual while knowing the dealer's total. (In a casino, this correction is normally done by a floor supervisor who is called over by the dealer if a card is exposed. Error 3: The dealer skips a player who had a valid bet in the betting circle. Stop play and adjust the cards back to give the skipped player the card he or she would have received if the cards had been dealt correctly. Error 4: The dealer deals to a betting circle with no bet in it. Stop play and adjust the cards forward to skip the empty betting circle and deliver the cards to players to the right of the skipped circle in the order they should have been dealt.